Flood-hit residents take refuge in a shelter. 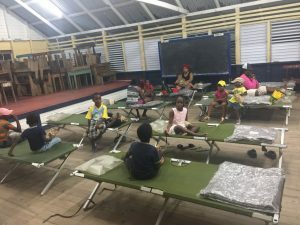 Guyana’s Civil Defence Commission has set up two temporary relief centres at the Uitvlugt Community Centre and the Uitvlugt Secondary School. Acting Director-General of the CDC, Lt.Col. Kester Craig said the centres would house residents affected by the flooding and would provide breakfast, lunch and dinner. Fire fighters placing sand bags at a building in anticipation of another high tide. Craig told Demerara Waves that 33 households at Stewartville, with an estimate of five persons per household, were affected by the flood. The flood was caused by extremely high spring tides that broke off a section of the seawall at Uitvlugt. A CDC Damage Assessment and report on West Demerara flooding says at Ocean View Housing Scheme – Stewartville has 32 households werw affected by flooding (squatting area – 11, regularised area – 21). Guyana Fire Service has 59 ranks assisting the Leonora Cottage Hospital with cleaning. The lower flat of the hospital was flooded. At the seashore at Ocean View some of the boulders were displaced from their original position. Tuschen-Uitvlugt NDC Chairman Mr. Vishal Ambedkar is gathering damage information. 130 chickens died, household appliances damaged, and wooden and concrete fences were destroyed. The wave was reported to be in excess of 25 feet high and travelled a distance of in excess of 50 feet to the roofs of homes. This event happened at approximately 3:30 Friday morning. Emergency Shelters have established at Uitvlugt Community Centre and Uitvlugt Secondary School. The CDC says it will be deploying 100 camp cots, 100 blankets, 100 pillows, cooking utensils and meals. This will be distributed between the two (2) shelters (Uitvulgt Secondary School and Uitvulgt Estate Community Centre). Hot meals will be provided for the affected from Friday evening and until Monday March 5, 2018. The impact areas were visited by Acting Prime Minister Honourable Vice President Carl Greenidge, Minister of Communities Ronald Bulkan, Minister Dr. Karen Cummings and Minister Annette Ferguson. The CDC is also preparing sanitation/cleaning hampers for subsequent distribution. The Leonora Cottage Hospital has been temporarily closed. The Health Centers at Den Amstel, Uitvlugt Community Center and De Kindren will be used to address medical emergencies. The Health Centers at Den Amstel and Uitvlugt are now operating on a 24 hour basis. The Guyana Police Force will increase its patrols in these areas. The Leonora Cottage Hospital, which was inundated with about 12 inches of water, has been closed and operations transferred to the Den Amstel Health Centre and the West Demerara Regional Hospital. Fire fighters helped scrub the hospital of the silt-laden seawater. The CDC also distributed relief supplies and sandbags. 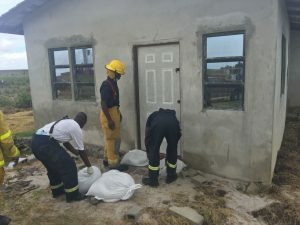 The Guyana Fire Service assisted in cleaning and securing the Leonora Cottage Hospital and is also assisting with the distribution of sandbags. Another high tide was forecast for 3pm and overtopping was also expected along with flooding. “The CDC team will remain on the ground for the next high tide and provide requisite assistance and guidance,” government said. Residents in the affected areas were asked to take all necessary precautions and to stay away from the seawall and sea dams during the high tide. Residents should also avoid all unnecessary contact with flood waters. Precautions should include moving all animals and poultry to higher ground, elevating furniture, appliances, electronic equipment and other valuables in lower flats, unplugging all appliances and electrical equipment in lower flats and using sand bags around doors to buildings.